I am a little fascinated with pain at the moment. No, I’m not a masochist. In a good way, actually, in a very powerful way. Over the years, I’ve learnt if I am prepared to sit with pain – heart pain, head pain, even body pain and allow myself to feel it, with a deep understanding that it can’t hurt me (meaning it won’t stop my heart or dissolve a limb), it seems to pass more quickly. And, when it’s gone and the lightness returns, if I have not battled the pain, reacted to it or tried to deflect it, I feel stronger – not ragged and raw. This may not be news to some, but it has been a slow maturing revelation to me: one that I’ve dipped my toe in, then my foot and now I almost welcome the opportunity to test myself. Maybe because I numbed pain for so many years, I am now hungry to feel everything; the deliciousness of joy and expectation, the heart-trembling adrenaline of fear and the hot rage of defiance. Yes, there are many painful feelings with no charming aspect at all, they just hurt and must be endured. Emotional pain that sweeps through our day, so often unannounced: the sharp sting of injustice, regret or shame, the gut-wrenching ache of disappointment and fear, or the deep dull weight of grief and sadness. It can touch for a moment or linger for days and weeks. Often our immediate response to pain is to resist or try and deflect it somewhere else. Treat it like a hot potato – fire up our burners of rage or indignation and toss it on to another, hoping the pain has no chance to find a home with us and we have a reprieve for a moment. It hasn’t gone anywhere though; we’ve just wrapped it in a more palatable coat. It’s now a different pain – a victim pain, a self-righteous pain: the kind of pain that will make us sick, drive us to drink and hide the beauty of the world. Have courage my beautiful friends; creativity, discovery and transformation are often born of pain. I can’t give you an elixir to make any of it go away; I can help you move from victim to warrior. Name it – just to yourself, no one else need know. What are you feeling? Guilt, shame, loneliness, disappointment, fear, embarrassment……. Feel it – it won’t kill you, it will just hurt. And you will survive hurt. Appreciate it – you are alive. This is what it is to be human and present. It is a privilege you will not have forever. Dance with it – turn the music up, scream, smash something, weep big big tears – till your eyes are ruby red. Own it – it is yours, the moment you own your emotions, you can choose to change them. No one makes you feel anything; it is always a choice. 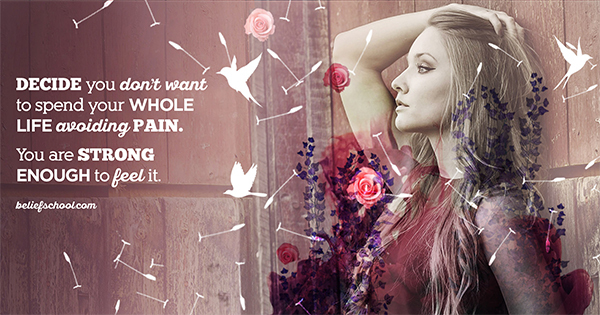 When we hold our pain, and we don’t deflect it on to someone else – it stops with us. Imagine how peaceful the world would be, if we could all hold our pain. This is so TRUE! I think victim pain just feels more powerful than the unbearable vulnerability that comes with feeling grief, hurt, abandonment. But that’s an illusion. Suiting up in the armour of angry victim is really only creating a prison. Great blog! Nothing like the protection of righteousness to avoid feeling pain! !